Magnum power in basic black. Taurus Model 65 .357 Magnum Revolver. A favorite among security professionals. The Taurus Model 65 is a medium frame, 6-shot Revolver has comfortable grips and a deep, lustrous finish. It features fixed sights and a custom single/double action trigger for improved accuracy and speed. This Model 65 is the perfect partner for concealed carry or plinking at the range. Make your day! Drop the hammer, order yours ONLINE today! 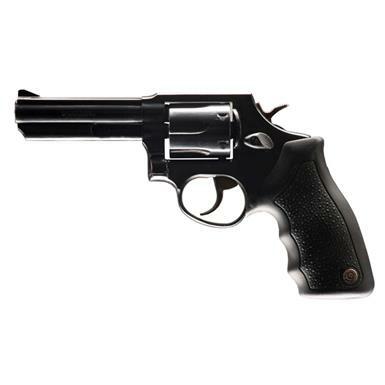 Taurus Model 65, Revolver, .357 Magnum, 4 Barrel, 6 Rounds is rated 4.8 out of 5 by 5. Rated 5 out of 5 by JP357 from Great shooter Great Price! Love the parkerized finish! Put 50 rounds through it - so far so good! Rated 4 out of 5 by Tank from Nice revolver! When I received the revolver,it was much better quality than I had expected. Trigger was much smoother than expected, on par with S&W. Rated 5 out of 5 by Mikial from Great gun at a great price with no hassle SG had a great price on this wonderful gun, and they sold it to me on their 4 payment plan with no drama. Once I bought it, their shipping to my FFL was very fast and simple. SG is my first go-to choice for pretty much all my outdoor and shooting needs. They sometimes don't have what I need, but I always check SG first. Rated 5 out of 5 by Minnygator from Great gun for the price This is my first revolver, having only shot 9mm semi-autos previously. The gun is solid, heavy, and feels well constructed, no rattles or squeaks. Cylinder locks up fairly tight. DA trigger pull is what you would expect, SA is light and crisp. Rubber grip feels good in the hand and helps tame recoil with 357 rounds, 38 specials have almost no kick at all. The only negative I have about this gun is with the front sight -- it is very small and, because it is blued like the rest of the gun, it is very hard to see, so I may need to add some sight paint. But otherwise I am very pleased with this gun. Don't let the Taurus name dissuade you! Rated 5 out of 5 by frank from GREAT PRICE GOOD VALUE FOR THE MONEY GREAT LADIES GUN, AS IT'S HEAVY ENOUGH TO HELP WITH RECOIL. LIGHT ENOUGH TOP HOLD AND FIRE ACCURATELY.